When we wear the conventional rucksack as intended, the person behind us can access the contents better than we can: an unnerving design fault in our densely populated cities. Years of commuting between London and Berlin brought the problem to my attention. I thought up a better way: remove outer zips and let your back protect the entry points when you are wearing the bag. I sketched the design for a year before making it myself. After saving up, I left my office job in March 2014 and started prototyping. 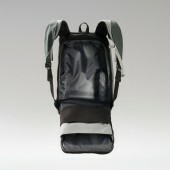 Unlike all other rucksacks the RiutBag faces the opposite way. 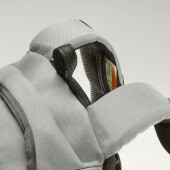 The body of the RiutBag has revolved to place all of the outer entry points against the wearer’s back. Why? 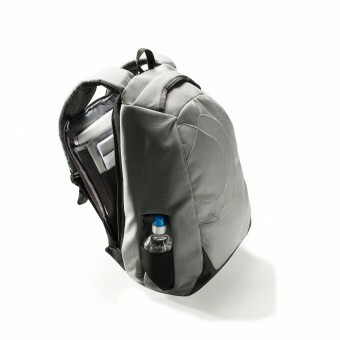 Because when you wear a conventional rucksack, the person behind you can access your bag better than you can. That’s an unnerving design fault in our densely packed cities. With a RiutBag commuters and city dwellers can travel without suspicion or others or fear of crime. A simple upgrade which impacts the user positively. 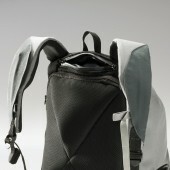 RiutBag use is similar to conventional rucksacks: worn on the back on both shoulders and removed to access. Travel features: Back zips only for peace of mind around fellow travellers; Hidden ticket pockets in each strap to reduce requirement to remove bag; Small upper pocket for phone, passport, wallet, keys; Main opening is cushioned laptop, tablet and cable compartment; Bottle holder within profile of RiutBag with gap to stop users placing keys, phones and other important small items at risk. The project started in March 2014 in Reading. I prototyped in Cheltenham and ran my crowdfunding campaign online from Istanbul, Berlin, Paris and London. Manufacture is taking place in Huian, China. My first 1000 customers are all over the world from Cambodia to Norway and the USA. Timeline 2014 March: Still in sketch form; May: Prototype one; July: Prototype two; September: Prototype three (in uploaded images); October: 30 day Kickstarter campaign; 26 November: 63,743GBP raised by 1091 backers; 2015 January: First production run, China; February: Ship to Kickstarter customers; Materials RiutBag: foam-lined Cordura outer shell, lycra laptop holder, foam-lined Thermoplastic Polyurethane base. Standard webbing, mesh, YKK zips. RiutBag width 340mm x depth 150mm x height 470mm Weight: 1.06kg Capacity: 20 litres Laptop size: up to 15"
Online survey to establish views of real commuters using rucksacks and remove my bias whilst prototyping. Format: 1 large and 3 small surveys with unknown commuters mainly in UK using Surveymonkey. 1000 commuters aged 18 to 70 took part. 6 percent of commuters experienced theft on commute; 60 percent of commuters were concerned about theft on a daily basis; Function more important than appearance; Water bottles important All results analysed by designer, referenced in prototyping and manufacture. Challenge: create outer pockets that hold bottles/umbrellas but not valuables e.g. smart phone, keys or money. After five different bottle holder prototypes I hit a brick wall and removed the bottle holder from the RiutBag. I reread the survey user. Almost all commuters wanted a bottle holder. I took a week off and found the new solution: bottle sits within the profile of bag with gap in the wall; this means the user is not tempted to store small important items. All images of RiutBag: Photographer Jasper White, RiutBag images, 2014. All images of Sarah Giblin: Photographer Graham Flack, Sarah Giblin images, 2014. 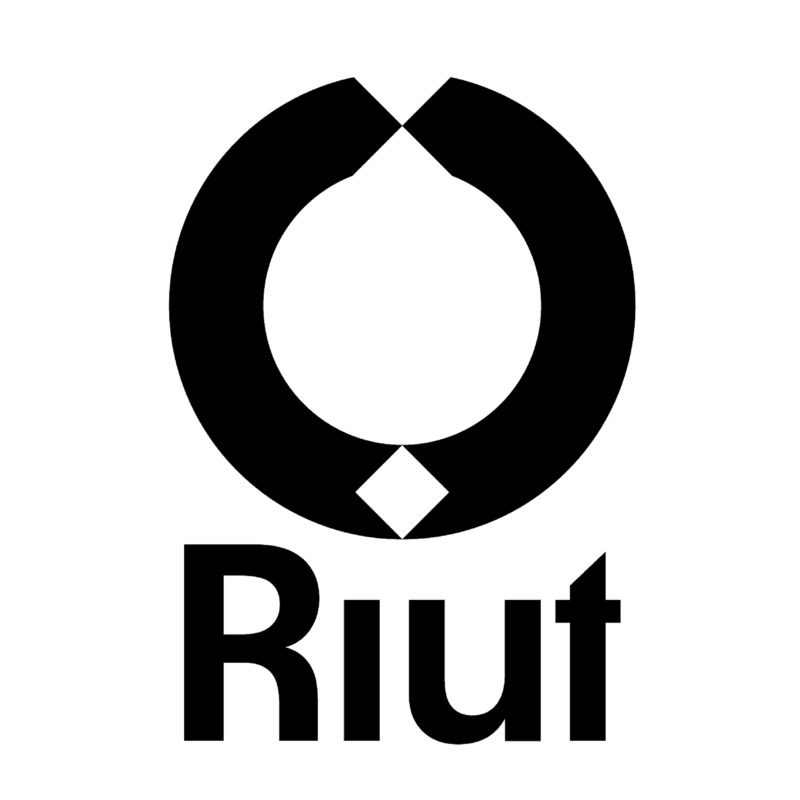 Riut stands for Revolution in user thinking. Pronounced "riot", this disruptive yet positive design philosophy built the RiutBag - the rucksack with no outer zips for calm, safe city travel. Fully funded on Kickstarter, November 2014. 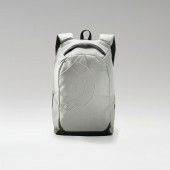 Riutbag Rucksack by Sarah Giblin is a Nominee in Fashion and Travel Accessories Design Category. · Click here to register today inorder to be able to view the profile and other works by Sarah Giblin when results are announced. Riutbag Rucksack by Sarah Giblin is Winner in Fashion and Travel Accessories Design Category, 2014 - 2015. · Press Members: Login or Register to request an exclusive interview with Sarah Giblin. · Click here to register inorder to view the profile and other works by Sarah Giblin. Did you like Sarah Giblin's Accessory Design? Did you like Riutbag Rucksack? Help us create a global awareness for good accessory design worldwide. Show your support for Sarah Giblin, the creator of great accessory design by gifting them a nomination ticket so that we could promote more of their great accessory designs.